He started his career at an unknown date, as a disciple of Ôtani Hiroemon I, who gave him the name of Ôtani Kotosuke. 11th lunar month of 1716: he became katakiyaku and took the name of Ôtani Ryûzaemon I in at the Nakamuraza, performing in the kaomise drama "Mitsudomoe Katoku Biraki", which celebrated the shûmei of Arashi Kiyosaburô II. 19th day of the 2nd lunar month of 1721 : his master Ôtani Hiroemon I died. 11th lunar month of 1722: Ryûzaemon played at the Moritaza the roles of Taira no Munemori and the minister Takenouchi in the kaomise drama "Yoshitomo Fukujukai". 1st lunar month of 1723: Ryûzaemon played in the same theater the role of Kajiwara Genta Kagesue in the new year sogamono "Suiryô Soga". 11th lunar month of 1733: Ryûzaemon played at the Nakamuraza in the kaomise drama "Nagi no Hana Asahi Genji", which celebrated the shûmei of Arashi Otohachi I. 11th lunar month of 1740: Ryûzaemon performed at the Nakamuraza in the kaomise drama "Miya Bashira Taiheiki", which celebrated the shûmei of Ichikawa Danzô III and Tomizawa Tatsujûrô. 3rd lunar month of 1741: Ryûzaemon's rank in the Edo hyôbanki, katakiyaku section, was jô-jô-kichi (superior - superior - excellent). 11th lunar month of 1745: Ôtani Ryûzaemon I and his son Ôtani Hiroshichi I respectively took the names of Ôtani Hiroemon II and Ôtani Ryûzaemon II; the father performed at the Nakamuraza and the son was at the Ichimuraza; the new Hiroemon played the role of Itô no Nyûdô in the kaomise drama "Suehiro Izu Nikki", which celebrated the arrival in Edo of the Kamigata actor Fujikawa Heikurô and the shûmei of Nakamura Denkurô II. 25th day of the 12th lunar month of 1745 : Hiroemon suddenly fell ill and died in Edo. 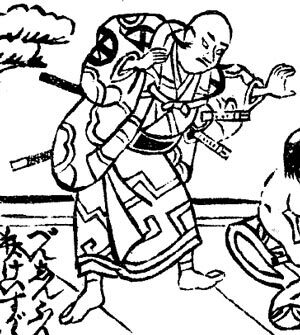 Ôtani Hiroemon II was a faithful katakiyaku disciple of Ôtani Hiroemon I. He transmitted the art of his master to his son Ôtani Ryûzaemon II. The 25th day of the 12th lunar month of the 2nd year of the Enkyô era was the 16th of January 1746 in the western calendar. The 19th day of the 2nd lunar month of the 6th year of the Kyôhô era was the 16th of March 1721 in the western calendar.